Fingernail fungus, or Onychomycosis, is more common than you may think, now seen more often in women than men. What was once an unheard-of ailment, is now a problem that anyone frequenting a salon for professional manicures (and pedicures) needs to be concerned with. Although not all cases are contracted from a salon, they certainly contribute if they do not properly clean and sterilize their tools. Nail fungus is contagious, but not highly. The fungus is most often seen in wet, warm areas such as showers, bathtubs, swimming pools, and locker rooms and anywhere people walk with their feet exposed. This makes the fungus more common in toenails than fingernails. Keep your nails clean and dry. Dry your hands and feet thoroughly after washing. Keep it simple and cut your nails straight across, not too short. Cotton socks and shoes allow proper ventilation and absorption of moisture. Fungus can also be found on tools used at home or in salons for manicures. Items such as fingernail files, tweezers, cuticle pushers can all harbor bacteria, so clean and dry your home tools thoroughly and select your nail technician carefully. Ask him or her about their hygiene and sterilization methods. A typical fungal infection of the fingernails or toenails is recognized by a discoloration of the nail, characterized with white or yellow, or brown spots. Other symptoms include deterioration of the nail, cracks, discomfort, foul odor, and possible separation of the nail from the nail bed. Those with athlete's foot often notice fungus in their toenails as well as their feet. Their toenails may thicken up, causing unpleasant pressure when putting on shoes or walking in them. Fungal infections usually do not go away unless attended to. Of course, preventative measures are the best way to avoid fungus, but once you're showing symptoms, begin treatment as soon as possible. There are many over-the-counter products that can be purchased for eliminating fungus and bacteria. 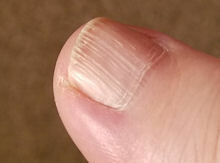 Anti-fungal creams can be applied directly to the nail and are generally inexpensive. For feet, medicated, anti-fungal powder absorbs moisture and can be used in addition to the creams. Natural, home remedies include distilled vinegar, vitamin E oil, Vicks Vaporub®, tea tree oil, and peroxide. Some believe these products cure nail fungus completely while others are quite skeptical. While none of these remedies have been a proven cure, tea tree oil seems to be the most helpful, and it's often contained in topical ointments. Keep in mind that you won't be able to get rid of the fungus overnight. Fingernails and toenails are tough material and are difficult to penetrate. You'll most likely see results after applying the solutions diligently, and after the nail begins growing out. Visit your doctor, who can take a sample and have it examined for fungi or other infections. He or she will probably prescribe an oral medication, such as Lamisil® tablets. Of course, there can be side-effects and this must be monitored. There are no guarantees and nail infections can return after they're abolished.